A familiar name has popped up at the top of the chip count in Event #10, the $5000 buy-in Seven-Card Stud tournament. Australian Poker Hall of Famer Jeff Lisandro leads the remaining 16 players as he eyes a remarkable sixth WSOP bracelet. Others still in contention for the title include Eugene Katchalov, Max Pescatori, Bryn Kenney, Perry Friedman, Cyndy Violette, Mike Sexton and Nick Schulman with all eyes on the first prize of USD $190,826 and a WSOP gold bracelet. Also noteworthy is this event was the bubble finish of 77-year-old Freddie Ellis. He won the Seven-Card Stud World Championship three years ago, which was the first time he had ever played at the WSOP. Ellis’s gold bracelet victory was just one of the highlights of what has been a fascinating life. He moved to New York City during the 1950s to pursue a career as a singer. He was not thrilled with travelling around the country and living the life of a struggling musician. So instead, he decided to invest in New York real estate and made a fortune. He is now semi-retired but is a regular player in a $600-$1200 limit Mixed Game, at the Borgata Casino in Atlantic City. 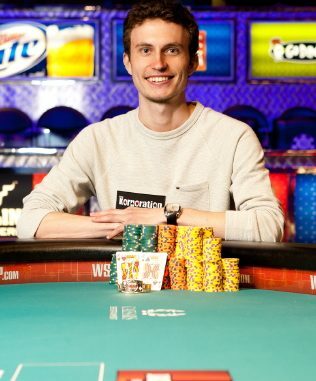 • As we touched on yesterday, the victory of Aubin Cazals (pictured) in Event #6, the $5000 No Limit Hold’em Mixed Max broke the run of seven US bracelet winners in this year’s WSOP. Oddly, French poker players have performed far better inside the US than back in their homeland. At last year’s WSOP Europe, held in Cannes, France for the first time, French players were completely shut out. The best finish by any French player was fifth. 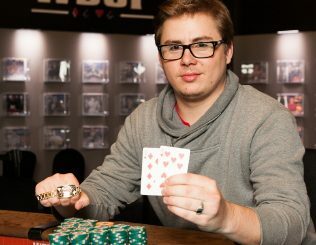 With Cazals’ big win, players from France have now seized four gold bracelets since June 2011 – all of them in Las Vegas. 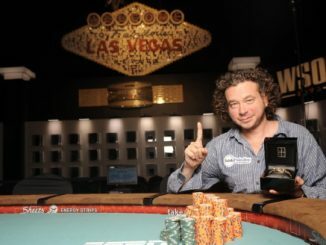 • Brian Rast, a two-time gold bracelet winner in 2011, rocketed into the chip lead in Event #9, $1500 buy-in No Limit Hold’em Re-entry tournament, for which USD $781,398 goes to the winner. Others in contention feature Scott Seiver, Jonathan Duhamel, Greg Mueller, Ari Engel, Lee Childs and Paul Wasicka. Event #11 the $1500 buy-in Pot Limit Omaha tournament also continues today with 117 players remaining. Chuck Tonne leads the pack, which includes Tristan Wade, Michael Binger and Sorel Mizzi. The prize pool amounts to USD $1,309,500 while the winner will collect USD $265,211 and a WSOP gold bracelet. Two events also kick-off today – Event #12, the $10,000 buy-in Heads-up No Limit Hold’em World Championship (capped at 512 players) and Event #13, a $1500 buy-in Limit Hold’em tournament. 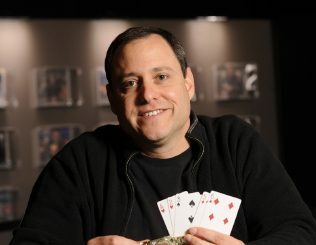 WSOP TODAY: June 15; Rubie goes for gold, Schwartz wins $1500 H.O.R.S.E. © 2017 Poker Media Australia.